About 2 million acres of forest land where you can find lush green thick forest, vast open land and almost burnt trees (probably from a jungle fire that struck Yellowstone few years ago). So many lakes, creeks and rivers meandering across the park that you forget the count of. Bisons, the huge wild buffalos, walking merrily about the park with their calves and block your way at almost all junctions. Once a while meeting with a "the grizzly bear", the monsterous beast that everyone fears and is warned about yet that which left by itself is the most dear animal. And then a moose, that has the most beautiful horns I have every seen. 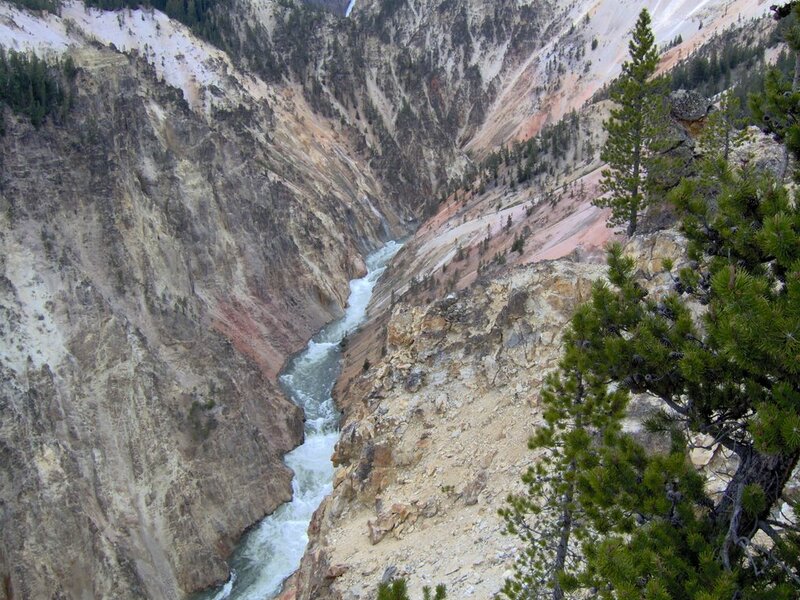 The grand canyon of the Yellowstone which tells you the meaning of word "Grand" in its true sense. The mersmerizing shades of yellow in the Grand Canyon that probably gave this name "Yellowstone" to the whole area. All this beauty resides peacefully by the land where hell bubbles up, "the chemistry lab of nature", the geyser basins of Yellowstone. 2 days is not enough for Yellowstone, everyone said that. But we managed get a glimpse of all the major attractions of Yellowstone National Park in 2 days. Hiking was on Tarun's mind throughout the trip and so our first trip was to the Grand Canyon on Yellowstone. The canyon extends fron the Canyon Village to Tower Falls and we decided to hike up from Tower Falls. It turned out that was a bad decision and the true glimpses of the Grand Canyon could be enjoyed better from the Canyon Village end. But we still found a trail around Tower Falls to hike which did not last very long as we realized the area was too lonely and we never had adequate preparation for "the grizzly". We turned back and decided to check out the Canyon Village end and indeed while returning just a few yards from that place we saw a grizzly bear grazing around. I could never imagine that a grizzly bear would be that huge. mountain laden with geysers all around, roaring the steam off. We woke up next day to a very beautiful day. The sunshine cheered the whole ambience and the mildly cold weather just great for another day out in the Yellowstone. We went back to finish the Norris Geyser Basin. 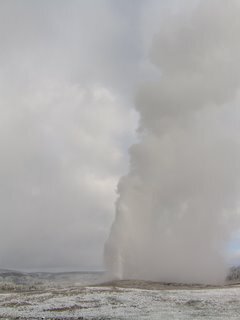 In that beautiful sunny day, it is inexplicable how manifold the beauty of those hot springs and geysers was enhanced. I had been looking for the chocolate pots all through and there I found a small one (looked like not really chocolate but cement pot) bubbling up making funny noises. Next stop was the Mammoth Hot Springs and wow they were really mammoth. 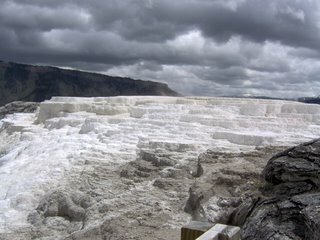 Mammoth Hot Springs were actually formed by the deposit of limestone by the hot springs over the course many years and I had never seen anything whiter than that on the main terrace of Mammoth. There was an interesting sculpture probably of stone called the liberty cap but I haven't got a chance to explore about it yet. We were just loving the sunshine but as we took of from Mammoth to drive by the Yellowstone Lake it started snowing, then turned sunny again, then rained a little bit and then snowed really heavily and that's what I would call a fickle weather. I read online that one needs to be prepared for any kind of weather in Yellowstone any time of the year and that was an example of it. 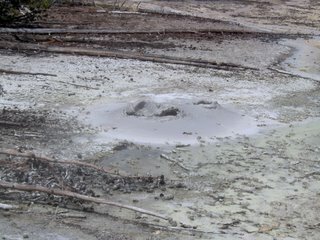 While it was snowing heavily I got a chance to see the Mud Volcano (probably that was the chocolate pot or may be I never found those chocolate pots) and the churning cauldron which was actually churning at a scary speed. It's said that there had been 500 earthquakes in the past 10 years. Our trip was coming to an end, just one day left which was most of the time to be spent in the car driving back to Seattle. 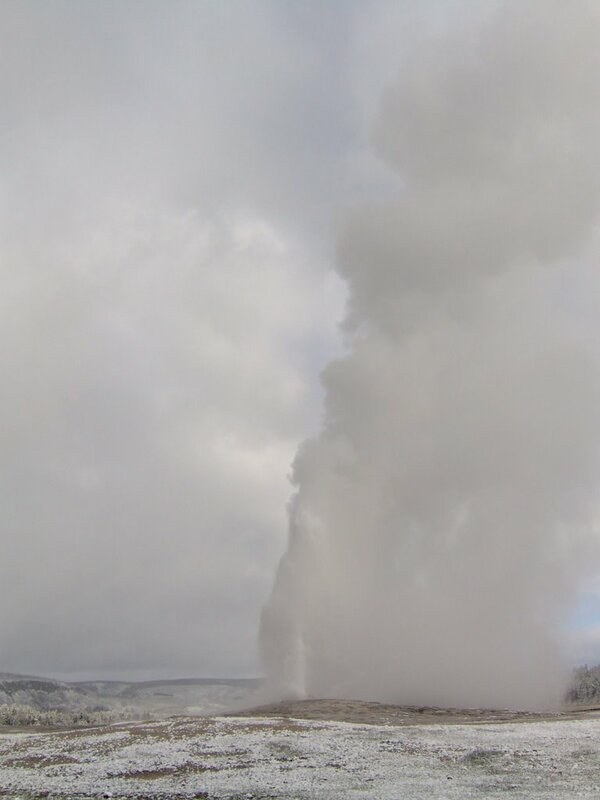 One last attraction of Yellowstone, the Old Faithful, was the one on our list. This really faithful geryser erupted just a few minutes after we reached there. It did shoot up really tall. What an amazing sight. "Rangers tell people to keep their distance from bison and steaming geysers. 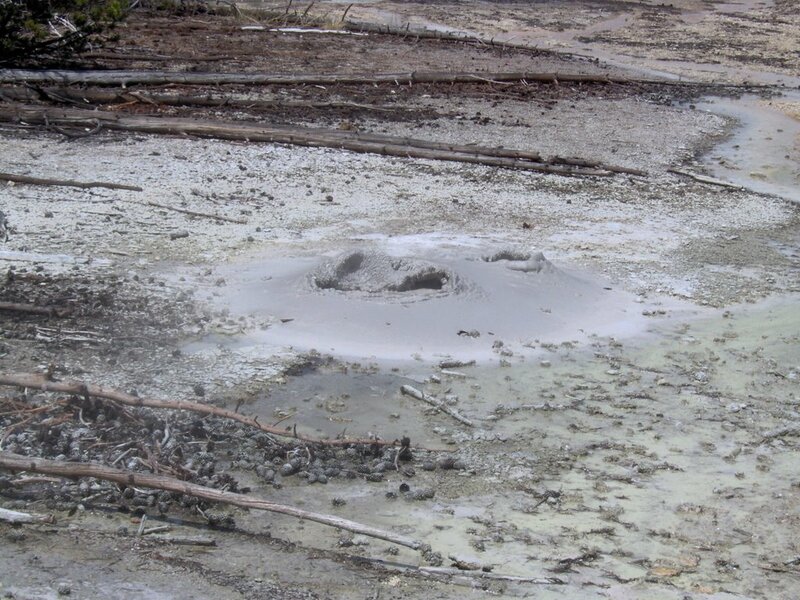 But there are no signs, aside from nature's own bubbling mud pots and geysers, that visitors are wandering through the caldera of one of the largest active volcanoes in the world." - National Geographic. And that leaves me truly amazed. 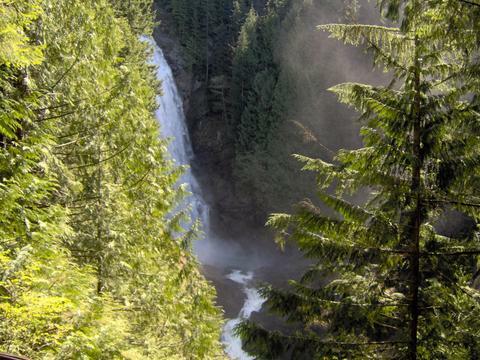 ...that's what I may call the hike to Wallace Falls. Jara is the dog of a new friend, Claudio (I hope I got the name right), that we met the same day (April 23, 2006). 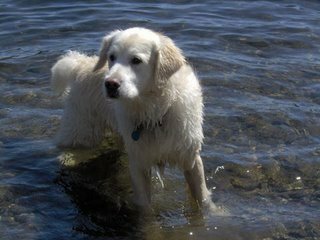 I am generally afraid of dogs but I have realized after coming to the US and meeting so many pets of my friends that after some time I feel fine with them. 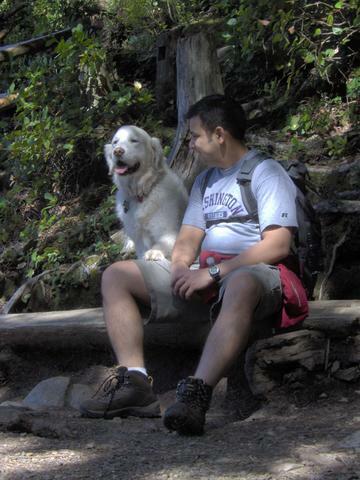 But, Jara was an exceptionally friendly and well behaved dog and he almost became a good friend of Tarun. Jara is an Australian name for a particular type of exquisite wood. That Sunday was a beautiful day, bright and sunny. Srijan, Amol, Arindam, Claudio, Tarun and me, we all met at the University of Washington Ave and headed towards the Wallace Falls State Park. It was a short drive of about an hour but that day we wounld't have minded driving a little bit more. As well expected, we arrived at the Wallace Falls State Park and found the parking lot to be nearly full. So there will be many more fellow hikers today... we thought. The sign board at the entry showed that there are three levels to the Wallace Falls hike: lower, middle and upper falls. Upper Falls was obviously what we were looking for, 6.5 miles roundtrip. We started on the Woody trail. A well built path makes its way upward and onward, climbing 1,200-feet to the falls. One can see evolved(?) trees along the way. I found it strange to see how trees have grown again from where they were cut or broken. True to what we had expected before, we met lots of people along the way, even small children. The hike up can be considered to be steep but a lot of fun under the shade of trees. Leading our way, however, was Jara and the poor thing had to always come back to check on whether all of us were still together. About a mile or so up we reached the Lower Falls and crossed over a bridge along the way. The roar of the Wallace and its crystal clear water is beauty of the whole hike. Lower Falls makes quite a view and very approriately leaves people longing for more. We stopped to watch the Lower Falls for a bit and then moved on. After about 2.0 miles we reached the Middle Falls. Well, actually after watching Middle Falls I realized Lower Falls were hardly a fall. We stopped to rest there for some time and just to enjoy the beauty of the falls and the scenic skykomish valley around it. Tarun sat on the bench and within no time Jara was sitting next to him. They two made quite an awesome picture to click and all of us did just that. Jara seemed to have learned about posing for camera :). Suddenly Jara put his paw on Tarun's lap as if they were friends forever, that was a "kodak moment". I thought that was really cute. After some time we moved on and hiked until the Upper Falls. I personally think that Middle falls, with landing of the falls in a big splash on to the rocks and the mersmerizing mist, was far more beautiful than the Upper Falls. At the Upper Falls we saw a notice prohibiting people to go into the woods not maintained by the state park on account of getting lost. We all thought instead. That notice was probably for people getting up there in the dark and not able to make out the few signs posted on the trees. The map showed there was a loop further from that point into the woods to the parking area. So we decided to venture into the forbidden zone. After only a few steps we came up to a trail which would actually lead us to the parking area. There we decided to halt for a bit for a quick lunch and Amol found a perfect place, right by a stream. There was hardly a place for everyone to sit but we all managed. Jara enjoyed the most in the water. We all finished our lunch and Jara his fun with water. Claudio pulled him back up to the ground and then as we all expected Jara gave a huge shrug off and we all were showered with water. We then continued on our long walk to the Wallace Lake, which was almost flat. I can't remember how long it was but it seemed long and along the way I had to bear some poor jokes from Arindam, Srijan and Amol. So much so that calling that poor would be a euphemism. Anyway, strolling across we reached the Wallace Lake. The trail down to the beach is rocky and we had to go through drooping trees and a puddle of water, but the vista from the beach is inexplicable. It seems there cannot be a better heaven anywhere else, our earth right here has so much to offer. I can't help but remember Robert Frost's "Stopping By Woods On A Snowy Evening" ... and miles to go before I sleep. The peaceful lake infused some kind of serenity in me as I sat on a log of wood just watching the lake and Mount Pilchuck beyond.